As part of the Marine CoLAB series, the goal for this workshop was set out the activities and outcomes for 2016 and to continue discussing how to organise beyond 2016, in order for the collaboration to continue and effectively communicate the Value of the Oceans and Marine CoLab issues. The group was updated on the running Marine CoLAB projects and a new 'consulting' hour has been established to support individuals with their Marine CoLAB-related projects. Facilitated and documented by Vali Lalioti. The workshop started with a introduction from Louisa and a reminder of our Mission and Vision to set the context for the day. 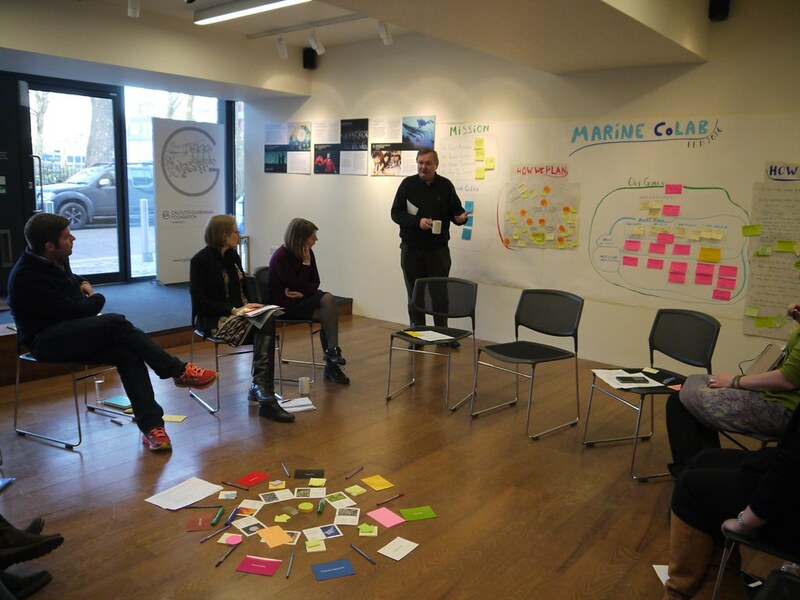 The focus of this workshop was the work-plan for 2016 along with the Action Learning Cycle of the Marine CoLAB. As well as continuing to develop the work-plan, communication and governance for Marine CoLAB, this workshop included elements of a practical Lab session (where the group could experiment with learning approaches such as the surgery session and the breakfast club). 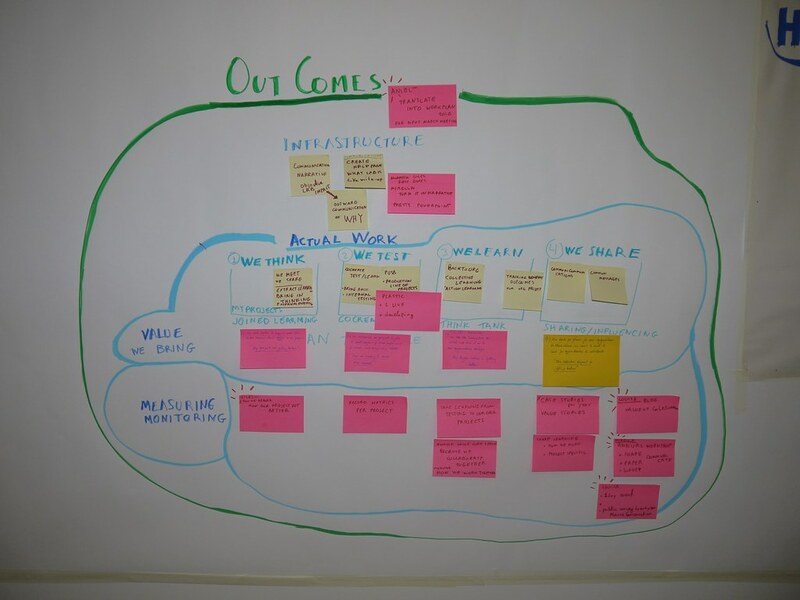 In the morning the participants established a work-plan, including identifying outcomes, infrastructure, internal and external communication, etc. This led to the CoLAB's four approaches (and associated values): We Think, We Test, We Learn and We Share. The need to measure and evaluate was acknowledged and captured as part of each work stream. In the afternoon the group focused on the Action Learning Cycle of the Marine CoLAB, along two themes: How we Plan and How we Learn. The group reached consensus on a common planning and structure, as well as on a learning and evaluation path for 2016 and beyond. In this workshop the concept of a consulting hour or surgery session was introduced, to explore how the Marine CoLAB could act as consultants and advisors for each other's projects. Sue Ranger discussed her project on Capturing the value of the Coast. The consulting proved valuable, and the group agreed that the surgery session could be a fruitful way of bringing in individuals' projects and add value to the participating organisations. The day finished with updates from the #OneLess project and the Breakfast club. The Breakfast club was held in the morning before the workshop, as an informal meeting between several Marine CoLAB members and external experts on marine conservation. The participants thought that the breakfast club would be a good way to bring in external people and to cross-fertilise between projects. In the evening the participants were joined by speakers Ollie Hilberry, Director of the MEAM (Making Every Adult Matter) coalition and Kellie Payne, Campaign to End Loneliness, who presented their history, governance structures and lessons learned, opening up to questions and discussion which continued during dinner.